New Delhi: Ethanol blending with petrol is estimated to touch 7.2 percent in 2018-19 marketing year as record 237 million litre of supplies have been contracted, according to sugar industry body ISMA. The ethanol blending was 4.22 percent in 2017-18 marketing year (December to November) with supply of 150 crore litres, Indian Sugar Mills Association (ISMA) said in a statement. "Against a requirement of 330 crore litres of ethanol for 10 percent ethanol blending in the country, excluding Jammu and Kashmir, North Eastern states and island territories, ethanol supply contracts have been signed for 237 crore litres for the ethanol supply period 2018-19," ISMA said. The association said this has been the highest ethanol supply contracts ever, beating the last year's figure of 160 crore litres. "If all the 237 crore litre is successfully blended in the country in the current year, about 7.2 percent of petrol consumption will get substituted by this environment-friendly bio-ethanol," ISMA said. This policy allows use of other than molasses as a feedstock to manufacture ethanol in the country. This includes sugarcane juice, damaged foodgrains, rotten potato, corn, surplus foodgrains, if any etc. For the first time, the government had in July and August last year announced different prices, with a premium, for ethanol produced from 'B' heavy molasses and sugarcane juice (which involve sacrifice of sugar production by diverting the same into ethanol) as well as ethanol produced from damaged foodgrains. 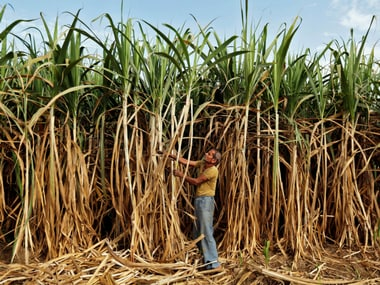 Out of total contracted ethanol supplies of 237 crore litre, 45 crore litre of ethanol has been contracted to be manufactured and supplied from 'B' heavy molasses and sugarcane juice, resulting in reduction of around 5 lakh tonne of sugar production. Similarly, 16.5 crore litre of ethanol has been contracted to be manufactured and supplied from damaged foodgrains, unfit for human consumption. "Ethanol is rich in oxygen and, therefore, is considered to be the best oxygenate in the world. The extra oxygen helps the balance petrol to burn more efficiently within the vehicle engine, thereby reducing vehicular emissions which, in turn, reduce environmental pollution. The ethanol accordingly helps in improving air quality," ISMA said.